The World's Biggest Aircraft, the Airlander 10 has left its hangar at Cardington Airfield to commence a brief series of ground systems tests before its First flight. It's the first time Airlander 10 has been publicly visible and a comprehensive series of in-hangar tests had to be completed before the exit at 4 o'clock this morning. 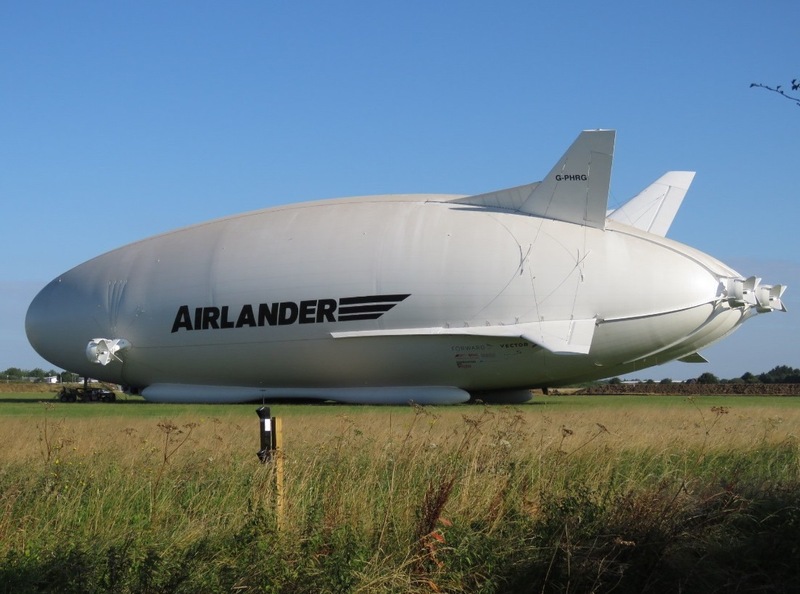 Airlander has now formally been granted permission to conduct its first series of flight tests by both EASA and the UK CAA. "Last week we successfully completed our final in-hangar all engines, all generators, all systems testing. My thanks to the whole business for getting us here. The entire team is looking forward to the final series of tests outside before taking to the skies for the first time." Being the largest aircraft in the world, exiting the hangar was a very delicate operation as there was only a 6m clearance from the fin tip to the sides of the hangar doors. It took around 5 minutes for the Airlander to clear the hangar and then a further 30 minutes for her be towed to rest at the primary mast site - one of the two that have been specially prepared for her on the airfield. The exit only commenced when Alex Travell, HAV's Ground Operations Chief, was given clearance to proceed by both Chief Test Pilot David Burns and Technical Director Mike Durham. All three of them had to be happy that a large number of safety, equipment and weather requirements were ticked off on the hangar exit checklist. The total team involved in exiting the hangar comprised of less than ten personnel, but was watched by 50 employees who gathered outside this airfield in the middle of the night to watch this unique occasion. "It was a very smooth first journey for Airlander and she behaved beautifully. We're delighted to have reached this significant milestone," says Technical Director Mike Durham. Now it is at its masting site, the aircraft is free to 'weathervane' nose into wind as a result of being attached to the Towable Moving Mast (TMM) and resting on the Castering Ground Cradle (CGC), which supports the fuel tank and has its own set of wheels. To minimise wear and environmental impact during this time, the landing skids have been fitted with special 'shoes'. A short time later and Airlander will be ready to take to the skies. "The Airlander will be able to withstand wind speeds of up to 85 knots whilst on the mast, making her very resilient to most weather systems that pass through. Whilst on the mast, there will be a strong 24hr security presence as well as staff constantly monitoring the status of the Airlander. While the aircraft is outside we would request that the public remains outside the airfield boundary at a safe distance and do not cause a road safety issue by parking on the double yellow lines or verges of the A600. Access to the airfield will be highly restricted during this process and the main airfield entry (Jackson Gate) will be closed. Whilst the Airlander is out on the mast, the last few tests (including full power engine runs, electromagnetic interference checks and a final overall vehicle systems checkout) will be conducted. At the end of these tests the team will assess the need for either a brief return to the hangar for final inspections or, subject to weather, those inspections may be carried out on the mast. Then it will be time for pilots David Burns and Simon Davies to take command of the Airlander 10, christened the Martha Gwyn in April, and start the flight test program of this unique and game-changing aircraft. We will announce the date of First flight in due course. The Airlander is expected to be a showcase of UK innovation and is already being used in the UK Government's "GREAT Britain" campaign to highlight the strength of the aerospace sector and the innovation in engineering this country is capable of creating. As the Airlander approaches first flight, customer interest has increased, particularly in the defence and security sector, and this, together with UK Government support should secure 400 new aerospace jobs as well as valuable export opportunities for the UK economy. The next step is to ensure the UK Government runs a trial in order to demonstrate the potential of this amazing aircraft to the world and secure the lucrative exports, and grow further jobs in Bedfordshire and in the supply chain across the UK (80% of Airlander's supply chain is British). This will help ensure the £6m of UK Government grants received thus far lead to orders. Hybrid Air Vehicles Ltd is also looking to raise equity through High Net Worth individuals and Institutional Investors to fund some aspects of the Flight Test Programme."